The 25 WSSM has similar ballistics to the .25-06 but in a much shorter case. It is a necked-up version of the .243 WSSM, which is in turn a shortened .300 WSM (Winchester Short Magnum). 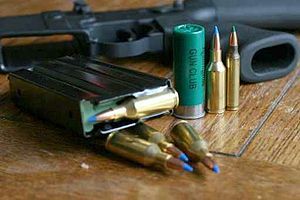 The WSSM cartridges are based on ballistics design philosophies that are intended to produce a high level of efficiency. Like other WSSM cases, the .25 is short and fat, which is designed to be more efficient. Unlike the other WSSM rounds, the .25 is a magnum in name only, based on the case it uses. Performance wise it is a clone of the .25-06 Remington, making it well suited for medium to large game. The 25 WSSM provides the same performance as the 25-06 Remington, with the advantage of having lighter short action rifles. Having the short fat design, the cartridge loads burn at a more consistent rate, providing a higher level of accuracy. Performance is far less than other .25 caliber magnum rounds as the .257 Weatherby Magnum. In fact, ballistically it's almost identical to the improved version of the .257 Roberts, which P.O. Ackley said was his favorite choice for an all-around cartridge. ^ "Browning WSSM info". Archived from the original on 2010-12-24. Retrieved 2010-05-04. This page was last edited on 21 August 2018, at 19:09 (UTC).